The Ace of Pentacles in a Tarot reading is a good omen for new beginnings in love and relationships that will thrive and prosper with the material things that you would wish for. The relationship will also generate a creative energy that will be of benefit to both partners. In the reversed position it can bring out the evil of wealth in people. A hand–issuing, as usual, from a cloud–holds up a pentacle. Perfect contentment, felicity, ecstasy; also speedy intelligence; gold. The evil side of wealth, bad intelligence; also great riches. In any case it shews prosperity, comfortable material conditions, but whether these are of advantage to the possessor will depend on whether the card is reversed or not. The most favourable of all cards. A share in the finding of treasure. 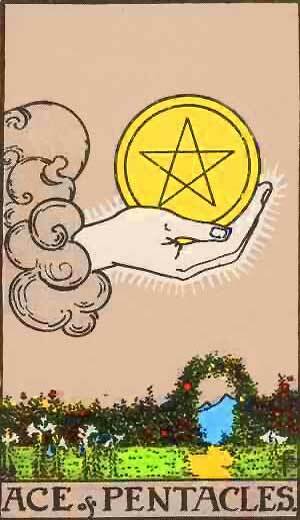 Ace of Pentacles – Perfect Contentment, Felicity, Prosperity, Triumph. Purse of Gold, Money, Gain, Help, Profit, Riches. Perfect contentment, felicity, happiness, ecstasy, perfect joy, perfect remedy, fulfilment of what has been asked in prayer. Reversed: Capital, riches, opulence, treasure. Something of principal value or valuable, dear, expensive, rare, highly esteemed. The element of Fire, of the nature of the Sun and Venus, on the house of the Sun, the Fifth: indeed this card has been well defined by the traditional renderings, which give it all as very benefic. How could it be anything else? The aces are all more or less a commencement, new prospects, etc. If you get the ace of pentacles or hearts on one of your houses in the horoscopic figure, you may be pretty sure that the matters to which the house in question relates will be beneficial and, on account of the fiery element, irresistible. It means the commencement of that what is wished for, desired, and this is what man calls his happiness. It is the spark of the Ego demonstrated in the practice of daily life; and this is what may well be called the note of good, which also brings good luck to other people. So there is creative energy in this card. Not yet worked out into details, but originally decided and fairly sure to work out in the future in lucky events and prosperous happenings. So there is promise in it and it is above all a card of good augury of a new and prosperous beginning. It is like a bright spark. Even among very bad cards it is the bright spark of hope and good-will, though of course in such cases it may be too weak to conquer adverse circumstances immediately. It may mean further a person or thing of first ranking. A child. A speculation. On the face of the small cube is a double vesica pisces, which also resembles the mathematical symbol of infinity and rhythmic whirling motion, the horizontal figure 8. This refers to the Qabalistic idea that physical form is the result of a series of whirling motions originating in the Primal Will—an idea practically the same as that to which modern physicists have been led by their investigations into the constitution of matter. The connection of the Ace of Coins with the Hebrew ideas relating to the Divine Number 1 is shown by the crown over the upper point of the pentagram, or five-pointed star. Behind the pentagram is a glory composed of forty rays, suggesting the operation of the ten Divine Numbers in the four Qabalistic worlds; and intimating also that the solidest physical forms are manifestations of the whirling motion of radiant energy. Of this motion the pentagram itself is another symbol, and its employment in various magical operations is based upon mathematical formulas directly connected with the figure itself, which formulas lead to mental control of the currents of the Astral Light. From the beginning of the sign Capricorn to the end of Pisces, from December 22nd to March 20th. The root of the powers of earth.. The power of will as expressed on the physical plane. Materiality in all its phases, whether good or evil. “The thing’s that are Caesar’s”. The power of the world-illusion. Material gain, wealth, contentment, and the things, conditions, works, and so on, which contribute to such gain. More information on the Ace of Pentacles Tarot card. This entry was posted in Tarot, Runes and Divination and tagged ace of pentacles, capricorn, earth, evil, feelings, love, money, pentacle, pentagram, prosperity, tarot. Bookmark the permalink.